Are you a slot aficionado? If so, you need to continue reading this column…it could be worth $500 to you! Let’s start by understanding what the word ‘aficionado’ actually means. The definition per the highly acclaimed Merriam-Webster Dictionary is a person who likes, knows about, and appreciates a usually fervently pursued interest or activity. A person can be a movie aficionado, a food aficionado or even a wine aficionado. One of my favorite magazines is called Cigar Aficionado published for cigar enthusiasts. And, if you are reading this magazine, you are probably a casino aficionado. According to reliable sources, approximately seventy percent of casino gamers enjoy playing slot machines and slot revenue for casinos accounts for nearly the same percentage. Just take a look around the next casino you visit and notice the amount of floor space dedicated to the machines. You will find machines with the basic three reels, machines with amazing graphics and touch screens and even machines dedicated to popular movies, television shows, game shows and board games. Two of the most popular slot machines in history are Monopoly and Wheel of Fortune. When it comes to designing and manufacturing these machines, slot developers turn to aficionado’s like you to give them feedback on what you like, and don’t like, before they go into full scale production. So, are you a slot aficionado? If so, your time has come to voice your opinion, and get rewarded for it too! 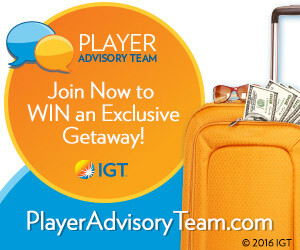 One of the largest slot manufacturers in the world, IGT, is looking for your input about everything from colors and sounds to design and reward levels, and is giving away great prizes to join their Player Advisory Team. Plus, you will get the first look at some of their games that are currently in production! What’s in it for you? A lot! Go to PlayerAdvisoryTeam.com today to join the conversation and you will be eligible for 1 of 75 $200 cash prizes as well as the grand prize of the Ultimate Casino Getaway that includes three nights at the casino of your choice, food and $500 of spending money! Good luck and be sure to join the Player Advisory Team today!